3,600€ 3,450€ TAX no inc. Size: 6,60 mts diameter – 34 mt2. Aviability: Stock / Under Request. 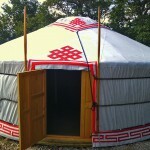 This is the most popular size for housing yurts. Ideal for touristic projects as glamping, as well as permanent house in ecovillages, rustic farms and gardens. A generous amount of space also suitable for hosting all kind of activities. 6 Walls complete Yurt, high quality, specially reinforced, treated and adapted to european weather. A charming natural round house completely portable and durable. You will simply love it! We work the wooden parts with larch and pine wood, with special drying treatment. DOORS: A strong exterior door (one layer) and also inside door (two layers with glass windows, for added visibility and natural light. All our doors have extra varnish! CROWN: Is the central ring at the roof, that unifies all the structure. Traditionally the four front parts from the crown are not covered while the four ones in the back are optionally covered by the hat. We include eight wooden frames for the crown, one of these with the hole for the stove pipe and seven with glass. All our crowns have extra varnish! 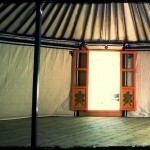 PILLARS: The two central pillars holds the crown in a medium size yurt, giving strength and stability to the structure. 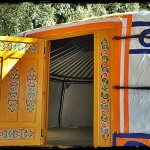 As bigger is the size of the yurt, will need more quantity of pillars. All our pillars have special fixations! RAFTERS: These are the accurately cut and carved poles that connects the crown with the walls. 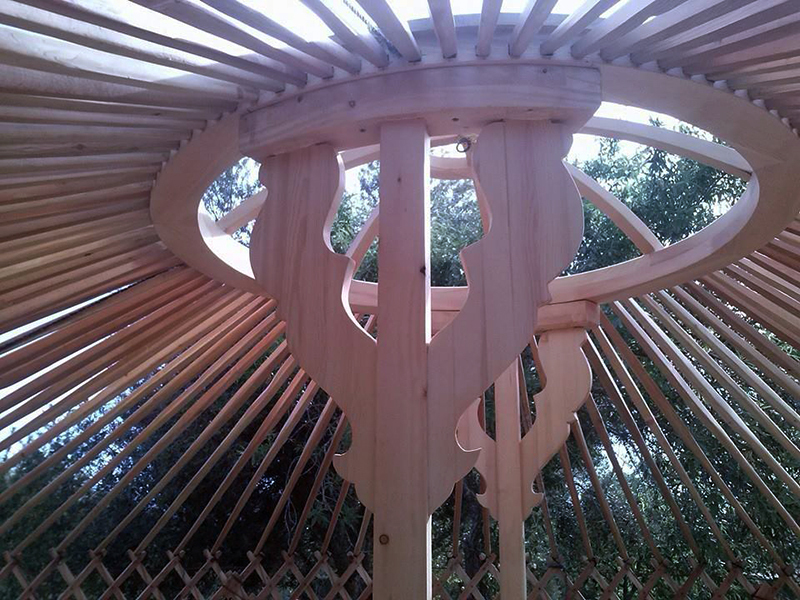 As bigger is the size of the yurt , the rafters will be more in number and longer. 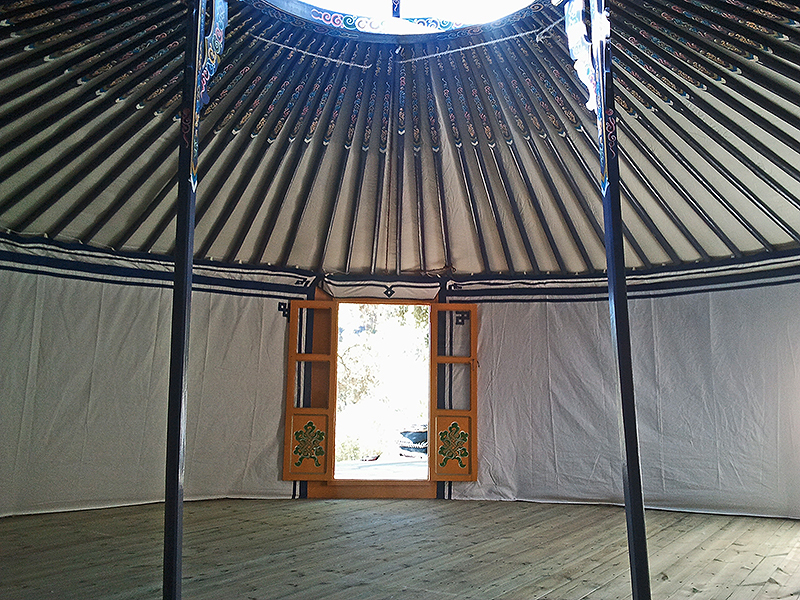 We give two extra rafters with each of our new yurts! WALLS: Extendable wooden nets, constructed in sections, linked to create the wall of the yurt. The wooden is cuted and bended with steam to be flexible and strong. All our walls have extra varnish! Textiles elements are very important as they ensure the temperature insulation and the impermeability of the whole structure. 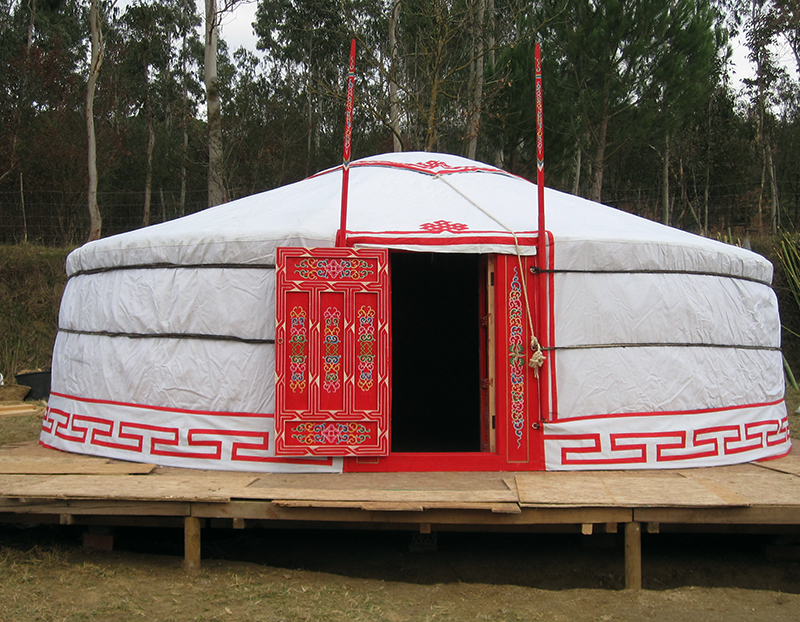 INTERIOR CANVAS: This is the first interior fabric, a white cotton cover installed on the roof and the walls, that gives luminosity and prevents that the loose fiber of the felt gets into the yurt. FELT: Built in 100% washed wool 2.1 cm thick, covering the roof and walls. 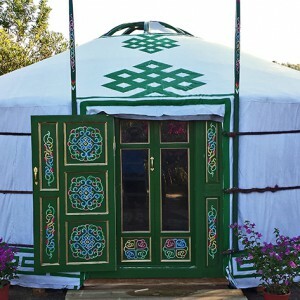 Excellent quality, its function is to isolate and control the temperature and humidity inside the yurt. 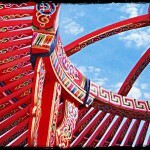 COVER: Is the waterproof outside cover, decorated with traditional mongolian designs. 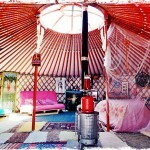 Gives a good resistance and a natural look to the yurt. The color of the cover is beige (sand). Includes reinforcements for wind and extra flap on the door! HAT: This is the cover of the crown, lined by the inside with felt for insulation and by the outside with waterproof canvas. To use at convenience: closed to protect the yurt from rain, or open to refresh the yurt and to see the sky. 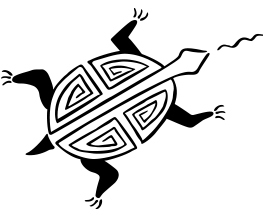 In beige color (sand) with traditional mongol designs. All our hats are extra large! 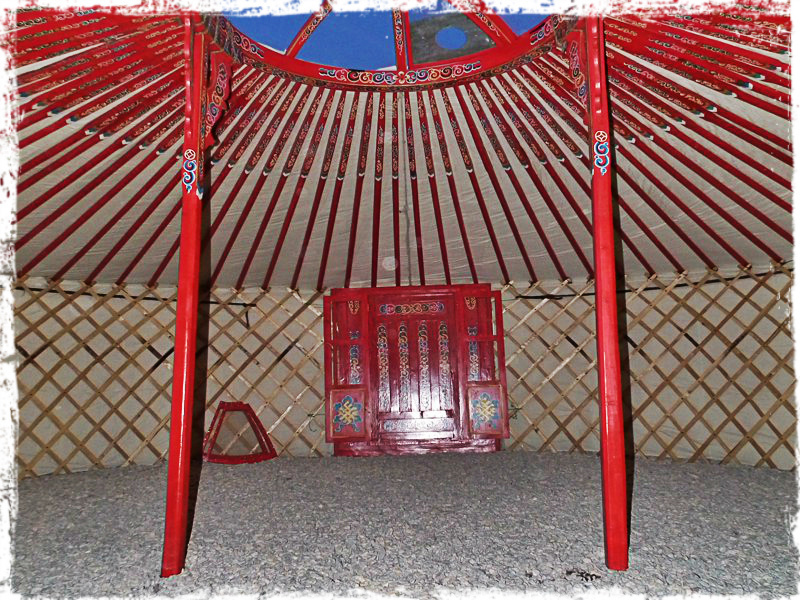 BOTTOMS: This is a strip of decorated waterproof canvas, which stands at the bottom of the yurt, which aims is to prevent splashing water in case of rain and wind. It is easily washable. In beige color (sand). ROPES: We work with 100 % natural horsehair ropes woven by nomadic families and other syntethic ropes. WATERFOOF EXTRA LAYER: The waterproof extra layer keeps the felt and wooden parts always dried, avoiding contact with moisture in rainy seasons. On roof and walls. 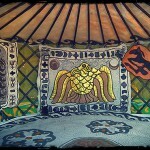 Included in all our new brand yurts and highly recommended for all european weathers! +34 972 178 053 or +34 699 049 521. Describe your order, contact information (including name, telephone, email and shipping address) and other specifications that you consider important. 2) We will reply you very soon with a complete quotation, possible date of delivery and the steps to confirm your order. 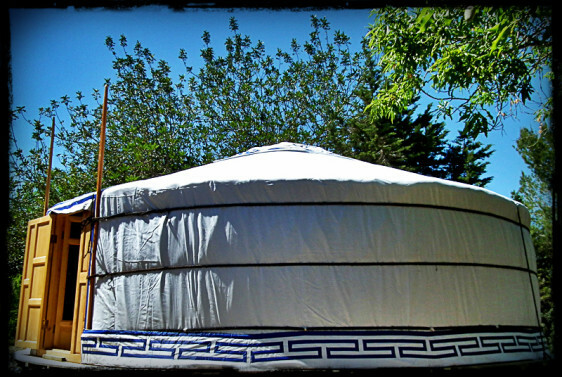 – We usually have some new brand yurts in stock, 6 walls and other sizes. 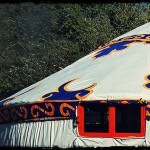 Anyway, please check for our availability of yurts! 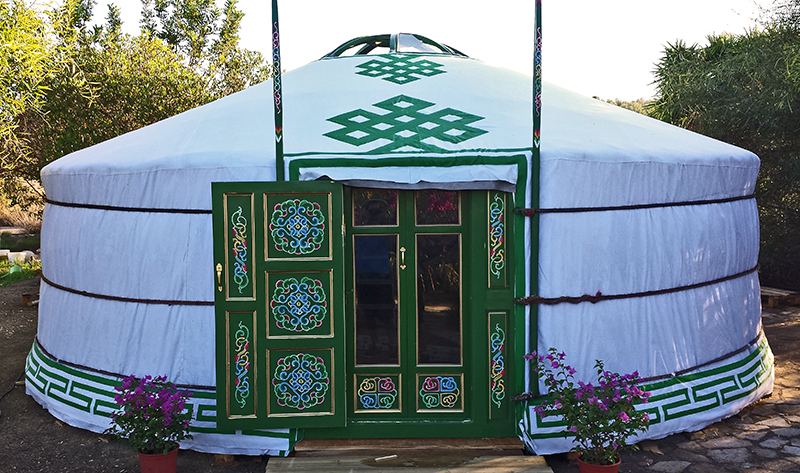 – We include with all our yurts a complete setting up guide with pictures and instructions step by step to set up the yurt by yourself. 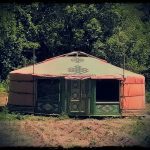 – If you buy one of our yurts and you are an european intra-comunitary operator you dont need to add the 21% of local taxes. 3,750€ 3,500€ TAX no inc.
2,800€ 2,650€ TAX no inc.
3,200€ 3,050€ TAX no inc.
7,000€ 6,750€ TAX no inc.
3,600€ 2,750€ TAX no inc.
3,200€ 2,350€ TAX no inc.
Ingresa tu correo electrónico para recibir periódicamente nuestras novedades. 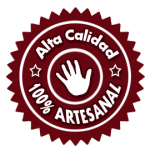 El sitio http://www.tipis.es utiliza cookies propias para recopilar información que ayuda a optimizar su visita a sus páginas web. No se utilizarán las cookies para recoger información de carácter personal. Usted puede permitir su uso o rechazarlo, también puede cambiar su configuración siempre que lo desee. Encontrará más información en nuestra Política de Cookies.Ok!